If you have a septic system in your yard, it is a good idea to know what types of plants you can plant and ones you should avoid. Septic systems provide extra moisture and nutrients to the soil and a boost to plant and tree growth. If you have plants that are deep reaching with their root systems, you are going to have a very expensive issue with your septic system. We have some suggestions that will allow you to have a beautiful yard safely with a septic system. Finding shallow root plants such as small ornamental grasses, wildflowers, and nonwoody perennials will not only be safe to plant above your septic system but will also benefit it by helping to stabilize the soil and not interfere with soil transpiration. By avoiding large ornamental grasses like bamboo and pampas grass, you will allow for the oxygen to still move freely to the soil to help break down waste and allow for evaporation of septic moisture. It is usually best to not plant trees over a septic system because their roots can be a significant problem. If you want trees on your property, it really depends on the species and the depth their roots will grow. Shallow root trees are definitely something to avoid. However, fibrous, deep-rooted trees should be ok if planted far enough away from the septic system. Knowing the species will help you determine the average mature height of a tree, which will let you know the anticipated width of the root system since the roots usually grow out as far wide as the tree is tall. If you want to know how far to safely plant a tree from the septic system, research the height of the tree at full maturity and then add 20 percent for safe measure. If you already have trees on your property closer than this to your septic system and are already experiencing roots clogging or breaking your drain pipes or septic system you will need to address this issue immediately to avoid further damage. 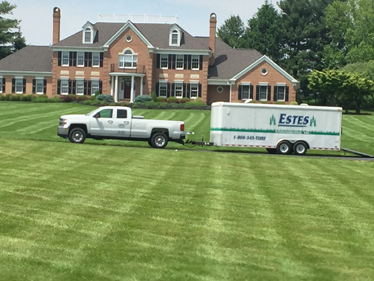 We can help you design the perfect septic safe landscape in Sykesville, MD. Give us a call today at (800) 345-8873.